New England Coffee is a privately owned coffee company in the United States. It is currently being managed by third generation members of the Dostuo and Kaloyanides Families. The New England Coffee company was found in 1916 by the Dostou and Kaloyanides families. The founders created the company with the belief in giving the highest standards of products and services to its customers. Those same beliefs are still being maintained after more than 90 years in business. In the early years following the company’s founding, they established their headquarters in a building located in Boston. Back then, hand roasted coffee was still delivered to customers by a wagon and horses. Not until 1918, when the company bought their first truck, did they improve their method of coffee delivery. It was also in that year that more family members started to join business. In 1966, the company moved in to what is now its new headquarters, located at 100 Charles St, Malden, Massachusetts. Over the years, New England Coffee has acquired five buildings. The company has expanded their manufacturing, as well as packaging facilities and equipment. Currently, the company is considered to be the largest privately owned coffee roaster. The company’s mission has remained the same in all the years that it has been existing, and that is to buy premium coffee, sell that premium coffee and give the best service that they can give. Among New England Coffee’s products include flavored coffee, decaffeinated coffee, roasted coffee (light, medium and dark) and gourmet coffee. Aside from their wide variety of coffee products, the company also offers gift baskets and novelty items (like tumblers, t-shirts and mugs). In January 2011, New England Coffee partnered with Alice.com in order to provide free delivery of the company’s premium coffees to its customers. 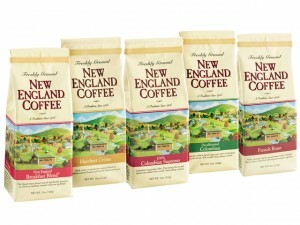 In March 2011, New England Coffee introduced its latest coffee products, which are all Select Dark Roast. As part of the product’s promotion, it produced a travel mug, which has also been set to a darker color. Hi New England Coffee, We love your coffee. I am Interested in Requesting any donation from your company. (coffee and /or tea) For our local fire company: West Pawlet Volunteer Fire Department for our annual Woodchuck Festival on February 4,2012. There will be the Woodchuck Challenge Course: we invite all fire companies to join the challenge , Where they will have so much time to rescue the person in need. Then there’s a Cow Plop Bingo, a craft show where we invite local artist to show off their stuff & there’s also the woodchuck cafe. All the proceeds go towards the up keep of our fire trucks and buildings that all comes out of pocket. Due to our volunteer work during Irene we have been named a Red Cross Station. We had people coming from many surrounding towns to our fire company during Irene . We were able to offer food,shelter & first aide and comfort to many. The contact person is :Ellen Park her # is 1(802)645-9161, cell# is 1(802)287 0093.The mailing ADDRESS IS 3936 Vt RT 153 West Pawlet VT 05775.Please contact Ellie with what ever you maybe able to provide us with.Also she can be contacted at this email address:fannielyn37@comcast.net. Thank You So much. sincerely The Lady’s Auxiliary of the wpvfd.